The tranquil feeling in the Sierra Mountains awaits you! This home boasts relaxation and elegance in its 3300 sq ft floor plan with 4 bedrooms and 3 baths the home will comfortably sleep 14 people. It features a well-designed great room, perfect for large entertainment, retreats and family gatherings. Escape into a romantic and spacious master retreat with a gas fireplace, a luxurious spa/tub and an outdoor deck to enjoy the views. With plenty of room for the whole family, the downstairs bedroom has two sets of bunk beds, a full pull out sofa and a television area for the kids. Gathering areas with plenty of room to enjoy family time, games or movies can be found both upstairs and downstairs. The main floor's great room features soaring ceilings with a fireplace opens, lots of windows and doors opening up to the spacious outdoor deck and Koi Pond where you can relax & enjoy the backyard lawn, forest and mountain areas. An old log cabin built in 1931 serves as a fun recreation room including a ping pong table & plenty of outdoor games. The estates green lawn area provides you with plenty of room for a family game of badminton or croquet and also make an ideal location for reunions, corporate retreats, romantic getaways, special events, and more. Enjoy this wonderful home all within minutes of shopping, entertainment, world-class outdoor pursuits and more. 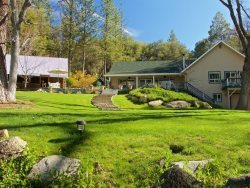 Conveniently located off Road 222, Bass Lake is only 4 miles away where the sporting enthusiast can be seen boating, water skiing, swimming and hiking in the summer. Enjoy an evening dining on the Lake with restaurants & dining all nearby. And to top off your stay, you are within 20 minutes of the South entrance to Yosemite National Park where you can tour and enjoy the breathtaking beauty of the park and it's waterfalls. We had an amazing time and would love to come back soon for our next annual camping trip or at least every other year. Beautiful property with more than enough space for 14 people.